'Cause it's only the funnestest Christmas movie EVER! | House Unseen. Life Unscripted. 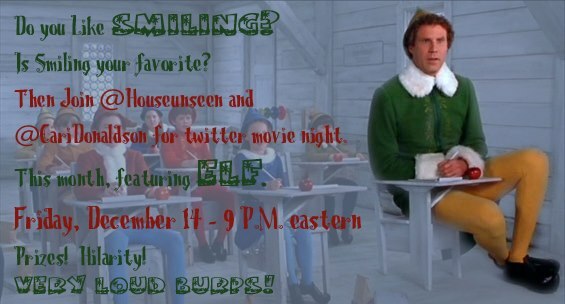 Elf Twitter party Friday! Whut whut! Incidentally, have you read Sr. Helena Burns post about why you should see this movie if you haven't already? Read it. Okay. Enough. Commence hazmat cleanup en la Casa Borobia. p.s. I wrote about Advent! And Bonnie agreed to publish it! More reading for you. Elf is a fantastic movie. We've watched it too many times over the years to count. See, I can even quote: "The best way to spread Christmas Cheer is singing loud for all to hear!" You're not Santa! You smell like beef and cheese! You sit on a throne of lies!! My oldest daughter and her boyfriend are going to a live performance of ELF at The Ordway in St. Paul, Minnesota. How lucky is that. That's their Christmas gift to one another. I was really hoping that Elf was the movie you considered the funnestest Christmas EVER! Because it totally is. Also, I love smiling. I've never seen it, because I honestly can't stand Will Ferrell. But, is it possible that I would give him a second chance because of this post?? Hmmmm, I'll have to think about it :). Right, okay, I'm going to see it, because everyone says it's sooooo hilarious, and laughter is my drug of choice these days! Love, love, love Elf!! I was trying to put it off until later in our month of Christmas movies, but we caved and watched it in Friday. Yeah, I'm ready to go back to an old school top loader next time too. Your husband totally wins at Christmas card pictures! I don't have an Amana, but have you cleaned the filter recently? Any time my front loader has issues, I always check the filter first. I burned out the entire motor once because the filter was full of old bobby pins. It was a sad day. Ruh roh...I didn't even know it HAD a filter to clean! Maybe they don't in the States? Mine has a little door down by the bottom where you screw out a sort of corkscrew thing which is typically full of all kinds of gross things, which luckily are not jammed in a pipe somewhere. AH! I have to work... Damn you job! Oh but what fun this would be... I just like Elf. Elf's my favorite! Are you feeling strong? Call me "elf" ONE MORE TIME.